Regent Software has begun shipping Regent Base II: 4GL SQL Database. Regent Base is a fourth generation language (4GL) that gives ST users with little programming experience the ability to develop sophisticated applications programs using a BASIC-like language. It also offers a powerful database management system with GEM interface controls. The system uses the American standard database language SQL (Structured Query Language), a system developed by IBM for novice database users on IBM's mainframe systems. Regent Base II is a major upgrade over the older versions. 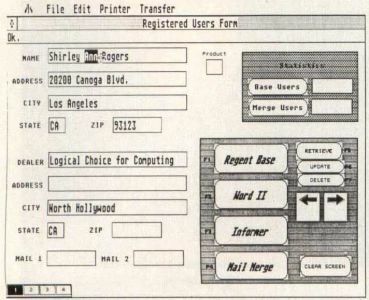 The new system supports many new features: Macintosh-style text editing, faster data retrieval speed, internal variables, more forms objects (icons, boxes, lines and circles), multiple-page forms, more procedural commands and full compatibility with Regent Base 1. 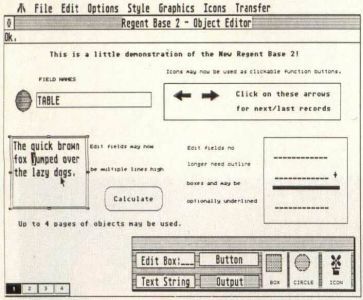 Regent Base II supports the Atari-sanctioned Clipboard for cutting and pasting text between ST applications. Regent Base II is now shipping with a new list price of $150. Registered users of Regent Base I can purchase a $50 upgrade kit directly from Regent Software.